MAKE | How-To: Pretty Flower Pom-Poms. Camp in Your Car with DIY Magnetic Window Screens, at Lifehacker. Clever! Introducing Purl Soho Video Tutorials! – The Purl Bee. Including two solid decreases (knit 2 together and slip slip knit) that were my way out of knitting rectangles. Weekend Project: Make a DIY Wooden Crate Magazine Rack | Man Made DIY. We have an old sheet music crate that needs this treatment. Clay Wishbone DIY, at Oh Happy Day. The second project that I created for Apothic is up on their Apothic Handmade page over at Facebook. 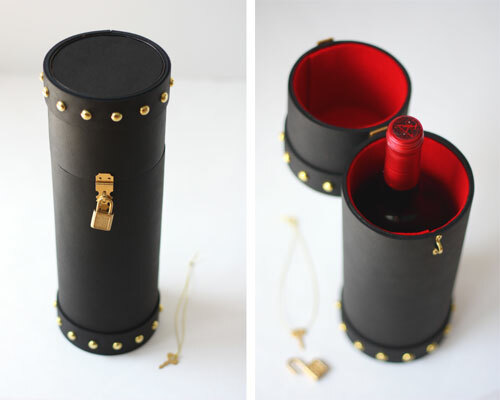 This one is a studded leather gift box lined in dramatic red felt that is only glimpsed after the box is opened. I used a tiny padlock to secure the box. Go see how to make it, and enjoy. Because this project involves wine please let me just say: Content intended for users of legal drinking age where this page is being accessed. 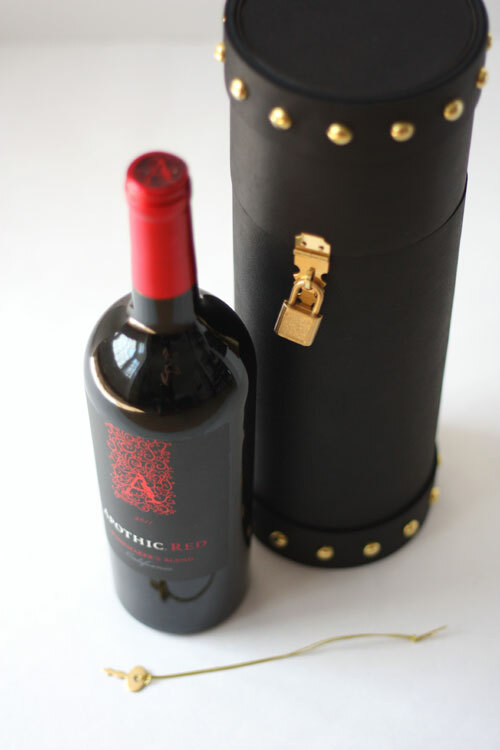 Apothic wine asked me to create a project for their Apothic Handcrafted set of DIYs over on their Facebook page. 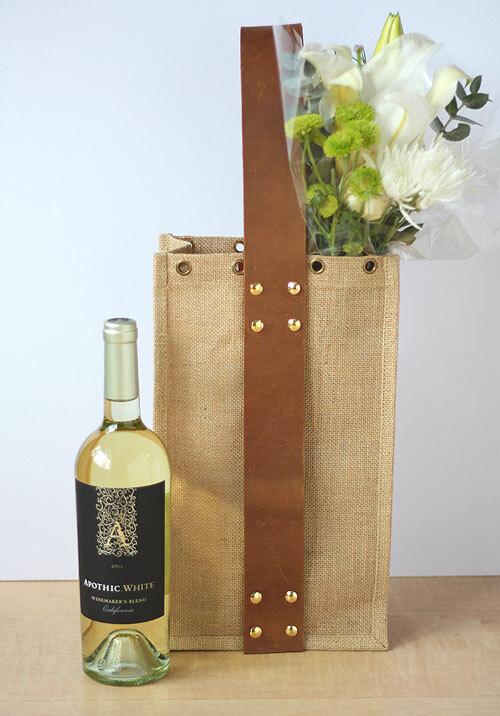 I made this wine tote with a chunky leather handle after thinking about those two classic hostess gifts, wine and flowers. 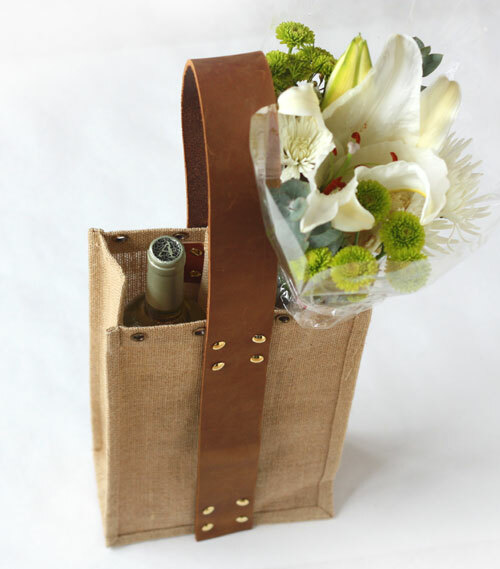 It’s created from two tall, skinny wine bottle bags that are secured side by side so you can bring along a bottle of wine and a bouquet or a baguette without fear of anything falling over or being crushed. You can give the tote as a gift, or do like I did and keep it all for yourself. I had a lot of fun creating this and it’s a good easy project if you want to learn to work with leather. To see the step-by-step instructions visit the Apothic Handcrafted project page. DIY // Waterproof paper coasters (and other paper pretties). The Dimensional Magic she uses here is a new to me product but looks handy, and easy to use. DIY Giant Crepe Paper Roses | Studio DIY. These are supersized but don’t lose any of their sweetness. Gold Leaf iPhone Cases DIY at Oh Happy Day. Love these. 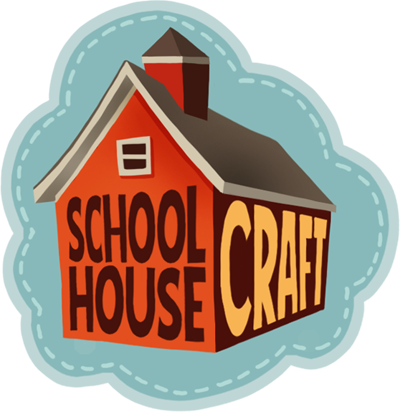 A Round Up of Knitting Tutorials at Juniper Moon Fiber Farm. There is a flat seaming tutorial in there that I’d like to learn, my own seams in handknitting are bulky and they make me sad. DIY // Upcycle any bag with leather straps. What a simple and impressive touch. Whit’s Knits: Knit Hedgehogs – the purl bee. These are so darn cute. DIY Brushed Text and Polka Dot Tea Towels and Tote – Home – Creature Comforts. The polka dot tote here is simple but oh so nice. How To: Make a Modern Geometric DIY Leather Mouse Pad » Curbly. From the mailbag: flickering LEDs in series | Evil Mad Scientist Laboratories. Technique – Finish Strings of Beads with Bead Tips – Luxe DIY. Flower Party Blowers at Oh Happy Day. So Many Sweets: Guest Post: DIY Cookie Cutter. Full instructions on making your own shaped cookie cutters, via Edible Crafts. Cool Tools – OLFA Auto-Lock Utility Knife. A simple, safe and inexpensive utility knife. Cool Tools – Strapworks.com. Recommendation for a store that carries all sorts of fasteners and buckles. Laura’s Loop: Cashmere Cuff – the purl bee. These are chunky grown up friendship bracelets. DIY Vintage Salt and Pepper Shakers | Say Yes to Hoboken.